CPL Scott J. Procopio Memorial Scholarship Fund | Show your support for the scholarship fund by making a donation today! 100% of your donation goes to scholarships and educational assistance for local students. The Cpl. Scott J. Procopio Memorial Scholarship Fund is involved in many local and national events and we encourace you to help out and support these events if you can! From Boston's Marine Corps Honor Run to the Marine Corps Marathon in Washington DC, we are active in events all year round in an effort to raise money for the fund, bring honor to Scott's sacrifice, and to promote awareness of our regions Gold Star Families and Wounded Warriors. We currently have several activites in the planning stages, and some others that are already scheduled! Show your support for the scholarship fund by making a donation today! 100% of your donation goes to scholarships and educational assistance for local students. Great way to show your support! Grey printing on a black shirt. Printed on front only. Available in small, medium, large, extra large and double XL ($2.00 more). 4" Round "Honor" Decal with Scott's information as well as the the Gold Star flag superimposed over the USMC Eagle, Globe and Anchor. 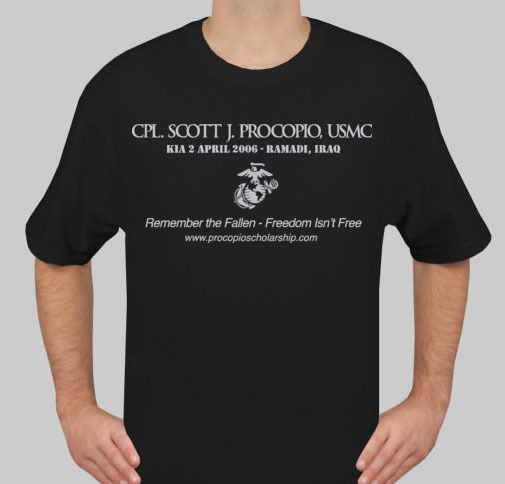 Copyright 2011 CPL Scott J. Procopio Memorial Scholarship Inc. All Rights Reserved.